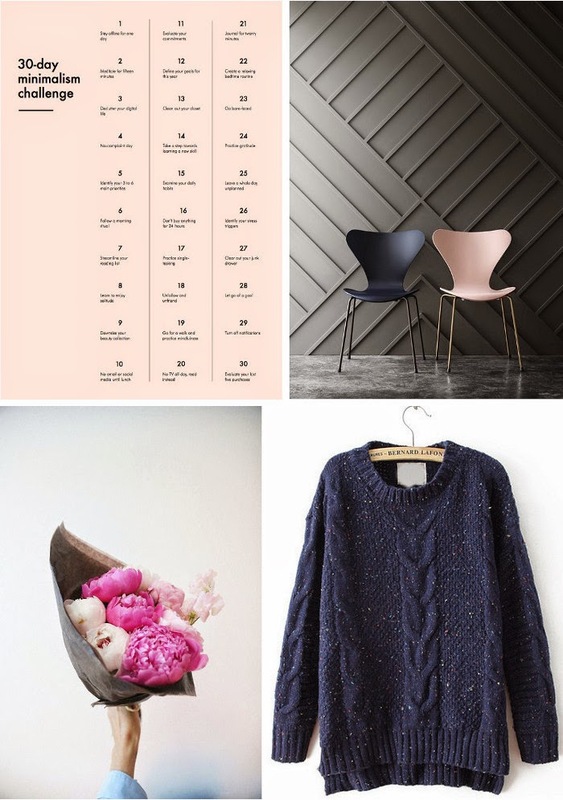 01: 30-day minimalism challenge by Into Mind | 02: The 60 years anniversary special editions of the Jacobsen's Series 7 chair - by Fritz Hansen | 03: Peonies always help the mind | 04: Navy Cable Knitting Rib Hem High Low Sweater . I know that a minimalism challenge should not be associated with some shopping wishes (point 16 - don't buy anything for 24h) but the Jacobsen chairs perfectly fit with point 5 (Identify your 3 to 6 main priority) (both, yes! ), the navy sweater is necessary for point 30 (Evaluate your last five purchases) (I remember only four so I need a fifth purchase to remember) (to be serious, I remember only two - the two chairs - ...really!) and flowers are flowers, they always help the mind and they could fit with point 24 (Practice gratitude). Have a nice monday.